The objective of China Europe Water Platform (CEWP) is to promote water policy dialogues, collaborative research and business development based on mutual interests and joint funding. It is of strategic importance for China and the European Union to improve cooperation on management of water as a crucial natural resource in order to avert a future global water crisis and its potential impacts on social and economic development and stability. CEWP is a regional component of the EU Water Initiative (EUWI). CEWP officially kicked off during the 6th World Water Forum in Marseille on 14 March 2012. Ministry of Water Resources of the People’s Republic of China and the Presidency of the Council of the European Union, represented by the Danish Minister of the Environment launched CEWP by signing of a Joint Statement. CEWP is led by two concurrent secretariats hosted by the Chinese Ministry of Water Resources and the Finnish Ministry of Agriculture and Forestry (representing the EU and its member countries) respectively. CEWP is supported by the EU and the People's Republic of China. The EU is funding the cooperation through Partnership Intrument and through co-funding of the EU member states participating the platform. Since the CEWP was introduced, four annual high-level dialogues have been held respectively in Zhengzhou, Budapest, Beijing and Copenhagen. 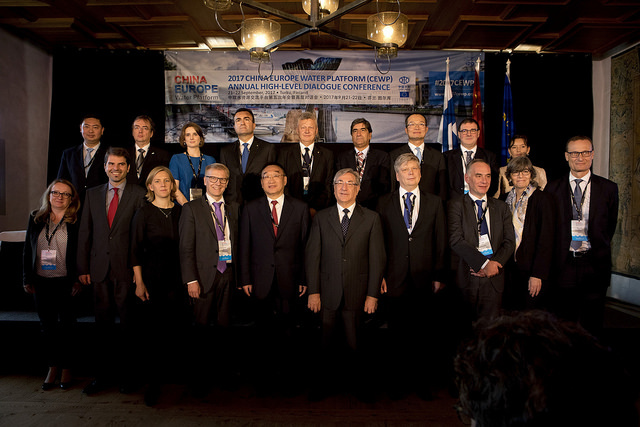 The 2017 CEWP High-level Dialogue Conference that was held in Turku, Finland with high-level representatives from 11 countries, EU, World Bank and OECD and over 400 delegates present, was concluded by the Turku Declaration and by the signature of a Memorandum of Understanding, establishing formally a Water Policy Dialogue between the EU and China. According to the Turku Declaration, during the next two years the CEWP will focus on reaching the UN Sustainable Development Goals associated with water and promoting a water-related circular economy. This takes place via even deeper water partnership between the EU and China and by increased cooperation with other international players in the water sector, not only in Europe and China but also outside. CEWP Work Programme 2018-2019 provides an overall framework for the development and implementation of CEWP. It presents the objectives and activities of CEWP for the coming years. From the beginning of 2018, CEWP has strengthen its activities with € 6 million support from the EU through the Partnership Instrument (PI). The Programs will encompass the four existing Focus Areas of CEWP as well as a new, Horizontal Activities Program which will support the EU Secretariat, boost the business and innovation activities and include new emerging issues to CEWP work. All EU Member States are invited to join the platform and take the lead in specific sectors or topics in which they have a comparative advantage or interest. Government agencies, research institutes, enterprises and international organizations from China and EU can also join CEWP and put forward specific topics for discussion. More information about how to join CEWP is available here.